CARPROOF VERIFIED** - Small is in, and Buick-a big-car expert-wants everyone to know it can do small just as well. 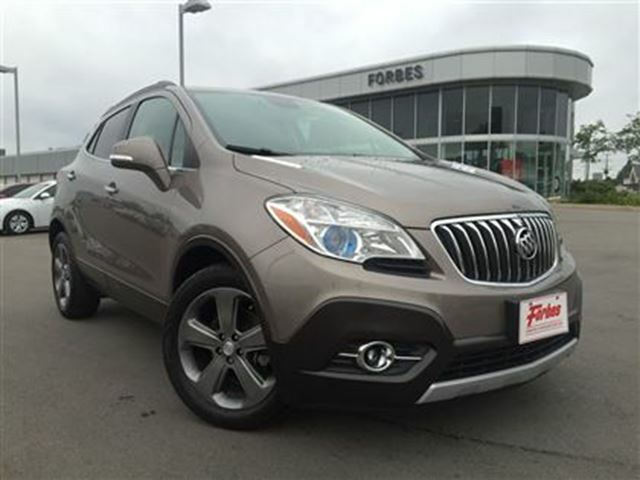 The Encore is a pocket-sized Enclave and features some of the big Buick SUV's traits. Its stylish cabin is feature rich, quiet, and comfortable for four! This 1 owner recent Ontario trade in comes equipped with: REAR VIEW CAMERA, 7 INCH SCREEN, BLUETOOTH, AUX/MP3/CD/USB IN, KEYLESS ENTRY, LEATHER WRAPPED STEERING WHEELS, CRUISE CONTROL, ALLOY WHEELS, TIRE PRESSURE SENSORS, DISC BRAKES, TRACTION CONTROL, 6 WAY POWERED DRIVER SEAT, A/C ... FORBES MOTORS is a FUN PLACE TO BE! We are a 68 year old family owned business and a GM OPTIMUM DEALERSHIP. We serve Waterloo, Kitchener, Guelph, Elmira, Cambridge and surrounding areas. Our goal is to give you an excellent quality experience that leads to a wonderful customer relationship. We would be grateful for the opportunity to earn your business! A smiling staff member would love to help you out at ! !